The Chough's Tap is a long-forgotten pub on Hendford that lasted a little over fifty years. A brewery tap is usually the nearest outlet for a brewery's beers, often a bar or room in the brewery although it may apply to the closest pub. In this case it belonged to the Three Choughs Hotel where, in 1837 a new brewhouse was built, as well as other works. The Three Choughs was considered a 'genteel' establishment and the Chough's Tap was therefore an outlet across the road where it could dispense its own-brewed beer to the working classes. 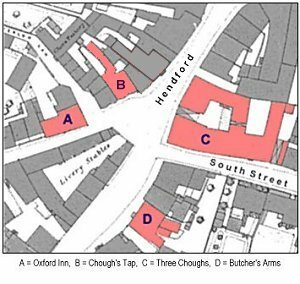 From the entries in the censuses, compared with the Ordnance Survey map of 1886, the Chough's Tap (marked 'B' on the map) was opposite the Three Chough's in the building recently occupied by Modelkits, later by the Yeovil Collector's Centre, next door to the Cottage Café, later Premier Wines and then Humbert's estate agents. 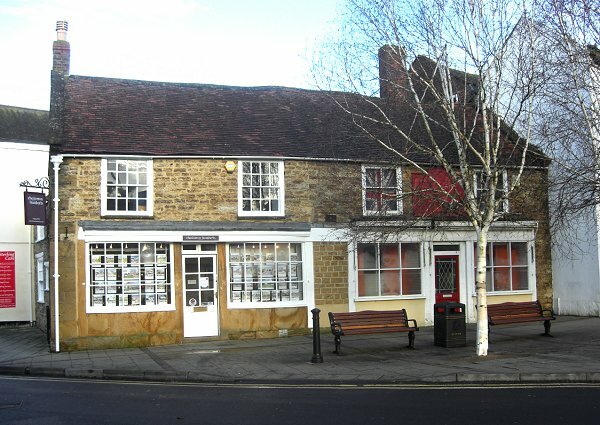 The building itself is probably eighteenth century and built as a small town house. Of two storeys, it is built with local stone under a tiled roof. At first floor the two windows above estate agents Humbert's retain their glazing bars and give a good indication of what the building originally looked like. By 1851 the premises, owned by the Three Choughs Hotel opposite, had been divided into two properties numbered, at the time, as 71 and 72 Hendford. No 71 was occupied by Chaplin & Horne, railway carriers and agents for the London and South Western Railway Company. Silas Allen was manager. No 72 was, from at least 1851 until after 1901, was the 'tap' of the Three Choughs Hotel known as the Chough's Tap. By 1919 No 72 was advertised as "Miss Caroline Chant, Refreshment Rooms (Choughs Restaurant)". The Choughs Restaurant was still operating in the early 1960s as seen in the first two photographs below. Of interest, there were also two breweries in Hendford at the time; Slater’s Directory of 1852 lists two “Brewers and Maltsters” – Thomas Cave and Edmund Henning, both of Hendford. Thomas Cave, who lived in a 17th century house in that part of Hendford which is todays Princes Street, became a partner with brewer Joseph Brutton in 1854. 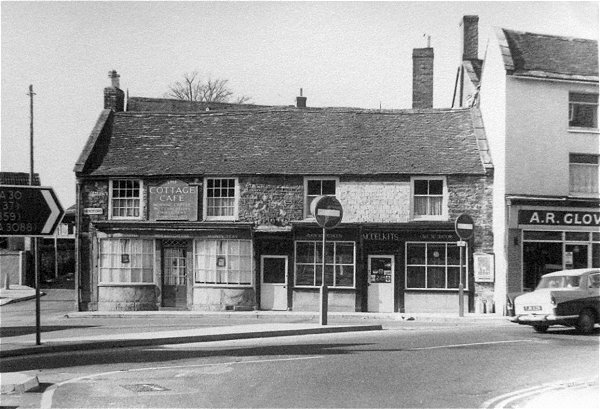 Henning operated what was known as the 'Old Brewery' located directly opposite Hendford House (today's Manor Hotel). Note: A 2015 re-examination of documents has now attributed the location of the Chough's Tap to the building as described here and not, as previously, to the building two doors away. The first recorded licensee was Edward Marsh, born around 1806 near Woolland, Dorset. He was listed as an innkeeper in the 1851 census with his wife, Sylvia, and their two children. In the 1861 census Edward's entry is almost identical except that the establishment is called the Chough's Tap. Edward died in 1865 and in Kelly's Directory of 1866 Silvia was listed as the licensee. Fanny Cox was born about 1829 at Channingston, Dorset. She was a visitor on her own in the 1861 census but noted as a labourer's wife. By the time of the 1871 census she was listed as a beer house keeper at the Chough's Tap. Fanny died in 1876. In 1851 Louis Slade had been living in Chant's Path (off Brunswick Street) with his wife, Eliza, and their baby daughter. Louis' occupation was given as 'tayler' and Eliza's was 'tayleress'. 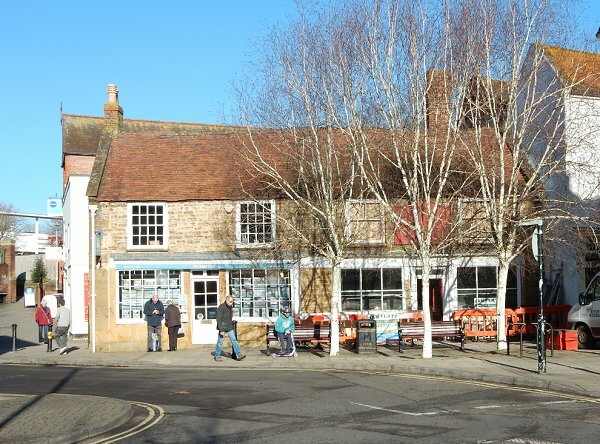 By 1861 Louis was described as a grocer and innkeeper and was running a beerhouse in Huish Lane. In 1871 he is noted as running the Full Moon but by 1875 he was licensee of the Choughs Tap but this was also the year he died. The following licensee, Sarah Dunn, was born about 1832 in Yeovil. She was married to a shepherd, John Dunn, and was living in Piddlehinton in 1871. By the time of the 1881 census, however, although listed as married she was licensee of the Chough's Tap where she lived with a 15-year old domestic servant. I could find no further trace of John. Sarah died in the winter of 1882. The final licensee of the Chough's Tap was Samuel Taylor, born about 1847 at Haselbury Plucknett, seven miles west of Yeovil. He was the son of George Taylor, a carrier, and his wife, Eliza. In 1861, at the age of 14, Samuel was working as a twine spinner and his 12-year old brother, William, was an agricultural labourer. 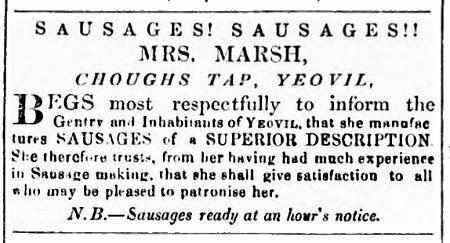 By 1881 Samuel, now married to Mary Ann, had moved to Yeovil with their daughter, Mabel. They were living in the cottage adjoining the Oxford Inn in Waterloo Lane (see 'A' on map above) and William was working as a carman. By 1891 William had moved 30 yards or so, and was the licensee of the Chough's Tap where he was listed in the census as an inn keeper with Mary and Mabel. Little happened during the next ten years and the 1901 census record appears unchanged from the 1891 except everyone is ten years older. By 1911, however, Mary had died and Samuel had retired and was living with his daughter, Mabel, and her husband, Frederick Axe, at 83 West Hendford. The Chough's Tap had closed and was a house and shop. 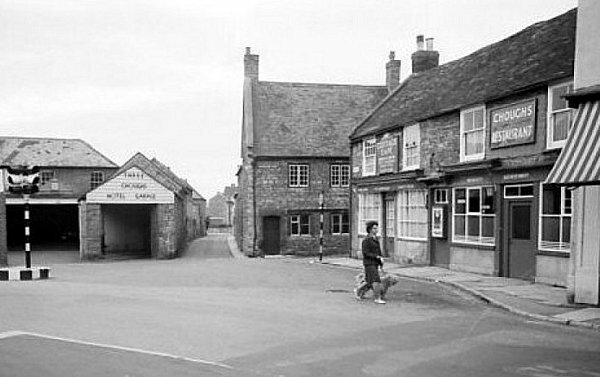 This photograph, taken around 1960, looks across Hendford and shows the very narrow entrance to West Hendford, originally called Horsey Lane, running alongside the Oxford Inn. Note that the Three Coughs Hotel (standing immediately behind the photographer) had a garage for patrons at left. This was the former livery stables of the Three Choughs Hotel. At right is the building housing the Cottage Café and the Choughs Restaurant, the former Chough's Tap. 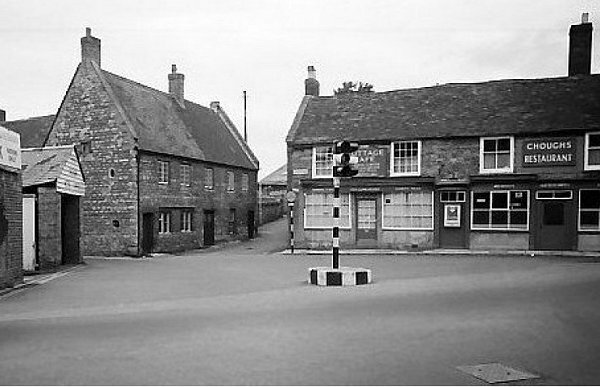 Again taken around 1960, the quaint roundabout with the traffic light had gone by the early 1970's - in fact when I moved to Yeovil in 1973 there were no traffic lights in the town whatsoever. Those were the days! Between the Cottage Café and the Oxford Inn is the entrance to Waterloo Lane. The Cottage Café and Modelkits, the former Chough's Tap, photographed in the 1970s. .... and photographed in 2013, standing empty. .... and again in 2015, being refurbished.